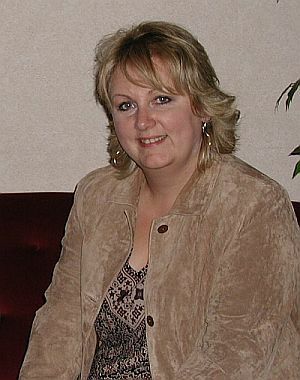 In 2004, we hosted Sue Cleaver, our Eileen Grimshaw, at the Westin Nova Scotia Hotel. Ms. Cleaver graciously brought many items of clothing that had been worn by members of the Corrie cast. These included a cap worn by Jack and autographed Bill Tarmey, a butcher's hat belonging to Ashley and autographed by Steven Arnold and John Savident (Fred) and a smock from the factory signed by all of the factory girls. All of these items were raffled to very anxious fans. See Diane's Web Page for more about this event with a link to some photos.